Slate tiles are the perfect choice for a number of different locations and rooms. Their earthy colors, natural strength, and unique texture provide an amazing finish that can be used indoors or out. 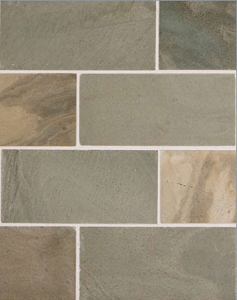 Bathroom floors are given a relaxing tone with these tiles that are naturally slip resistant. Walls of the bathroom or shower take on a new life when the slate is used to line them. The high traffic and spill prone location of the kitchen floor do well with these tiles since the metamorphic rock provides durability and texture. Used as a backsplash in the kitchen, slate tile produces a soothing, cozy feel to the space. Entryways with their exposure to the elements and foot traffic can easily be kept clean and neat with this water resistant stone. Dining and living areas are always well-presented with slate tile flooring, delivering a sophisticated and subtly elegant appeal. Visit one of our three Conestoga Tile showrooms located in Baltimore, MD; Sterling, VA; or Harrisburg, PA, where you will find amazing slate tiles to suit your needs.